Focus on what matters, the patient – and let Afinion™ CRP deliver a clearer treatment decision* in just three easy steps. A simple fingerstick blood sample delivers results in 3 minutes and helps avoid the misuse of antibiotics. CRP point-of-care testing helps to improve antimicrobial stewardship and reduce unnecessary prescribing of antibiotics, without affecting patient outcomes.4,6 Keep antibiotics working with Afinion™ CRP, for a clearer treatment decision* in just three easy steps. CRP point-of-care testing helps to improve antimicrobial stewardship and reduce unnecessary prescribing of antibiotics, without affecting patient outcomes.4,6Keep antibiotics working with Afinion™ CRP, for a clearer treatment decision* in just three easy steps. When you need a more accurate assessment when diagnosing infection, you need a device you can count on. 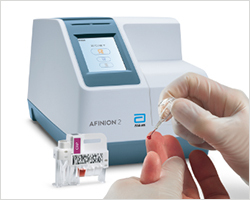 The Afinion™ CRP allows you to achieve a clearer treatment decision* in minutes with a simple fingerstick blood sample - enabling you to make a more confident decision when prescribing for your patients*. 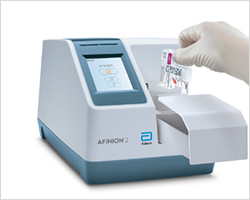 Managing patient consultations doesn’t have to be complicated, especially with multi-assay functionality available through Afinion™ 2. Make every conversation matter, with more inclusive POC results. 1. Collect the sample with the integrated sampling device. 2. Insert the sampling device into the cartridge. 3. Place the test cartridge in the analyser and close the lid. The processing starts automatically. 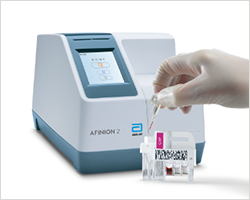 The Afinion™ 2 CRP allows you to achieve a clearer treatment decision* in minutes with a simple fingerstick blood sample - enabling you to make a more confident decision when prescribing for your patients. 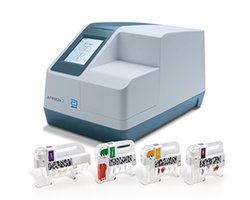 Abbott Rapid Diagnostics - A Leader in Rapid Point-of-Care Diagnostics. 10004301-01 11/18. 4. Tonkin-Crine SKG et al. Cochrane Database of Systematic Reviews 2017 (9) Open access: https://www.cochranelibrary.com/cdsr/doi/10.1002/14651858.CD012252.pub2/epdf/full. 10. Brouwer N, van Pelt J. Validation and evaluation of eight commercially available point of care CRP methods. Clinica Chimica Acta. 2015;439:195-201.